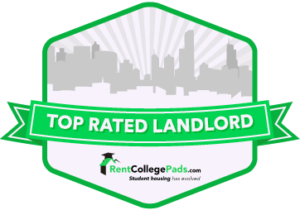 Don’t stress about signing a four person lease! Here at The Pointe, each resident signs their own lease to relieve the headache of being financially responsible for a roommate. Not only is The Pointe locally owned and managed, we also have property managers living in the complex. The managers can be reached 24/7, which lets you sleep soundly at night knowing that problems will be taken care of immediately. Whether you have friends in mind to live with or not, we’ve got you covered! We offer our residents the opportunity to meet with their matches before moving them in together. Bring your own belongings to The Pointe to make it your home away from home. Each unfurnished unit still provides you with a full sized washer and dryer as well as the standard kitchen appliances. Don’t want to worry about the hassle of moving furniture? We’ve got you covered with our fully-furnished units. Each furnished unit comes with a couch, loveseat, coffee table and two end tables in the family room, a kitchen table with four chairs in the kitchen and a queen-sized bed, 5- drawer dresser and night stand in each bedroom. Signal 88 provides our tenants with after hour, on call security as well as nightly patrols of our property. Lease an unfurnished or furnished apartment for under $500 per month. We provide an automatic rent payment program, free of charge, for our tenants. If you choose not to utilize this program, you can pay with cash, check or money order. We have a few different utility package options to choose from, whichever fits your budget the best! If I am on automatic rent payments, when will it be taken out of my account? Your account will be debited on the 5th of each month, unless the 5th falls on a weekend or holiday. If that is the case, your account will be debited on the following business day. What if I need to break my lease or can’t return for the Spring semester? The Pointe’s lease agreement is legally binding and cannot be broken. If you have signed a lease and can no longer live at The Pointe, you are responsible for the full terms of your lease or until you find someone to sublease from you. Use our online tenant portal to submit any maintenance requests. If you need login info or help, please contact the clubhouse. What if I need to get a hold of the clubhouse after hours? Call 573-228-9016 and leave a voicemail with your name, unit number and phone number. We will return your call as quickly as possible. You can also text us at 573-356-9251. Where do I receive packages? Packages will be delivered directly to your door if the correct address is given. If no one is home, the carrier will deliver the package to the clubhouse during business hours. We will notify you if a package arrives to the clubhouse. How do I sign up for automatic rent payments? There is one simple form to fill out. Just fill it out, attach a voided check, and that is it! You can use automatic withdrawal to pay for both rent and/or any overages on utilities. Does my lease provide coverage for my belongings in the event of a fire, theft, or natural causes? No, it does not. Renter’s insurance is generally inexpensive, so we suggest buying this to cover your belongings. Pets are allowed in unfurnished units only. There is a $300 non-refundable deposit per pet and an additional $30 rent each month. A pet agreement is required and it must be approved by management before having a pet. When is the fitness center open? All residents can access the fitness center during clubhouse hours. If you would like 24 hour access you can purchase a key fob at the clubhouse with a $10 deposit which will be returned to you when you move out. Is there a shuttle to campus? Yes, we have a private shuttle for all Pointe residents.